Your network and infrastructure is constantly changing. NAAP provides a powerful solution to keep you up to date on those never ending changes. NAAP is designed to provide consistent network/asset data in real-time. The NAAP Assets module allows users to track assets from procurement, through moves throughout the network, to repairs, to warehousing, to decommissioning. Having access to this information will lower capital expenditures and operating expenses by ensuring additional purchases are only made when truly needed. With the NAAP’s Asset Tracking tool you will be able to search for site and asset information as if you were out in the field looking for it. It is easy and intuititive to use since it is set up in a hierarchical manner based on the asset’s location and it’s relationship to other assets. 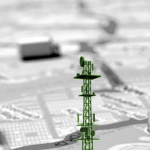 You can browse to an antenna by selecting a Site, selecting a Tower at the Site, and finally by selecting one of the antennas listed on the Tower. You dont need to know the exact tracking number of the asset & yet still find what you are looking for. Stay on top of your assets at every stage in the lifecycle, from acquisition to decomissioning and retirement. Organize, store and retrieve all pertinent information for informed and up-to-date decision making. Store and visualize asset data in a Hierarchical format: Sites, Towers, Shelters, Telecom Equipment, Cards, Computers, Generators, Vehicles and more! Product Library provides access to photos and product manuals for technicians to access in the field. Tracks asset warranties by the date installed and the length of the warranty. Retrieve and track asset information from an unified database. Use Google earth for Geo-location site mapping. Record asset warranties, know your coverage details. NAAP tracks and logs the asset location and history as it moves from site to site, from warehouse to site, or to repair centers. It can also can let you know when supplies are running low and replacements must be ordered so you can manage inventory efficiently. The NAAP Platform allows Management at any level of the organization to monitor and control any aspect of the business. The reporting tools that come with NAAP and the customized reports that can be made specifically for your company, will provide the information managers need to lead their companies with success. Track equipment, inventory levels, reorder value and cost per asset. Site report per city, state, country or region. Find assets associated with a specific purchase order. Analyze the cost of maintaining sites and the network for any specific time.